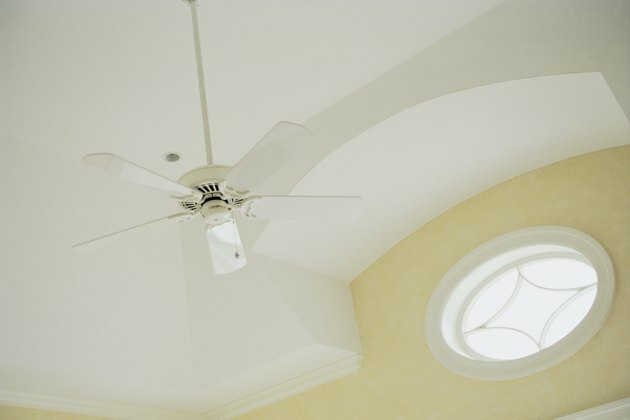 If you like working with your hands, installing a new ceiling fan can be a fun and rewarding task. However, there are always safety precautions that you must take. Always make sure that the electricity is turned off before working with electrical wiring. Grounding is another safety mechanism that reduces the risk of serious electric shock. Most modern homes are equipped with a grounding system integrated into the electrical system. Some older homes may not have ground wires present in the electrical boxes. Assuming that you have already removed the old light fixture we'll go straight to options for wiring the fan with no ground. Make sure that the junction box in your ceiling is one that is rated for a ceiling fan. If it isn't, you could be setting yourself up for a bad accident if the ceiling fan falls. As far as the ground wire is concerned, there are two solutions to this problem. The first solution, which is the better one but may turn out to be costly, is to have your home rewired, replacing all of the wiring with ROMEX® wires that include a ground wire. Also have a ground rod installed outside of your house. The second solution to the problem is to wire the ceiling fan without the ground. The ground wire doesn't carry any electrical current (unless there is a problem in your electrical system). The ground wire carries displaced electricity away to reduce the risk of electrical shock if, let's say, the metal parts of the ceiling fan or any other appliance or part attached to your electrical system becomes accidentally charged with electricity. So if you wire your fan without the ground wire, it will still work properly. However, the added safety of the ground wire will not be present. If you decide to wire your fan without the ground proceed to the next step. Mount any brackets necessary to hang the ceiling fan. Assemble the fan according to the manufacturer's instructions and hang the fan (without the blades) from the mounting bracket. Wire your fan using wire nuts to connect the white wire from your fan to the white wire in your ceiling. Next connect the two black wires in the same fashion. Don't worry about the ground wire for now, but having your electrical system grounded should be a priority. Continue assembling and installing your ceiling fan according to the manufacturer's instructions.